For the study, researchers replaced 36 natural starling nests in nest boxes with artificially made nests. Each nest retained the female's clutch of eggs. 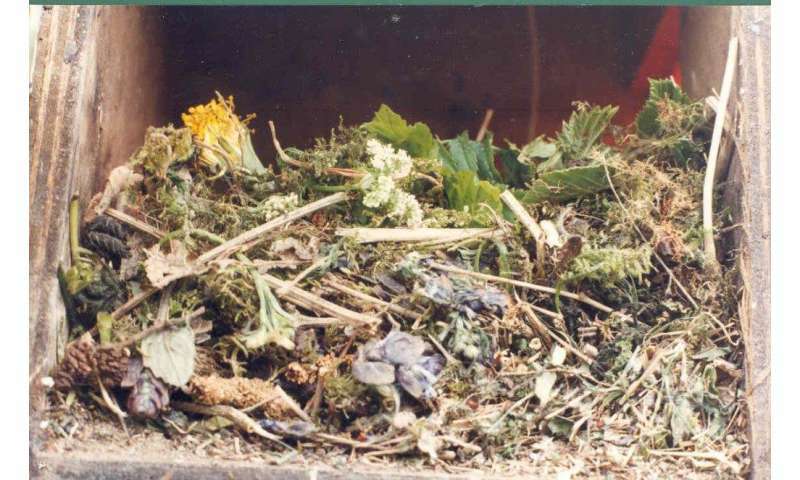 Half of the artificial nests included dry grass and a combination of herbs commonly found in starling nests. The other half of the nests had only dry grass. The herbs included were yarrow, or milfoil, (Achillea millefolium); hogweed (Heracleum spondyleum); cow parsley (Anthriscus silvestris); black elder (Sambucus niger); goutweed (Aegopodium podagraria); and willow (Salix alba). The researchers also placed a "dummy" egg in each nest, which monitored temperature in the nest. "Egg temperatures and nest attendance were higher in herb than nonherb nests—particularly early in the incubation period," says Caren Cooper, co-author of a paper on the work and a research associate professor in North Carolina State University's Department of Forestry and Environmental Resources. "In addition, egg temperatures dropped less frequently below critical thresholds in nests that contained herbs, and those parents started their active day earlier," says Cooper, who is also the assistant head of the biodiversity research lab at the North Carolina Museum of Natural Sciences. "While the data indicate that these herbs influenced incubation behavior in a positive way, it's not entirely clear how that's happening," Cooper says. "It's possible that one or more of the herbs have pharmacological effects on the parents," says Helga Gwinner of the Max-Planck Institute for Ornithology, who is a first author of the paper. "We had previously observed that young from nests that are rich in herbs have improved health indicators," Gwinner adds. "Starlings select particular herbs for decorating their nests. Intriguingly, some of these herbs are also used in folk medicine. Their known sedative effects might influence incubation behavior by inducing higher nest attendance and reduce exposure of eggs to low ambient temperature." "Use of volatile herbs is observed in many species," Cooper says. "More recently, birds have also started to include human objects in their nests. Their benefits and harm should be carefully observed."